Esther (Hester Augusta) Sadler was the daughter of James Augustus Sad(d)ler and Hester (or Ester) Squire(s). James was a seaman who arrived aboard Steadfast on 14 Nov 1852. She was the sister of Sara Ruth De Caux (nee Sadler) (16/05/1864-15/10/1942) who was married to Frederick De Caux (1868-13/02/1956), a farmer at Dingabledinga (7 children) who was the son of Felix De Caux (1822-1877). Miss Esther Sadler worked for the Post and Telegraph Department for 31 years (1884-1914) and she was the post and telegraph mistress at Kanmantoo (1884-1885), Curramulka (1885-1891), Willunga (1891-1901) and Kilkenny (1901-1914). She was a Wesleyan Methodist and while in Willunga she was actively involved in the Wesleyan Sunday School. On 1 October 1885 the new Post and Telegraph Station at Curramulka was opened at a cost of 770 pounds. Telegraph communication to Adelaide was conducted on a single wire to Minlaton and then via Maitland. Miss E. Sadler was the first postmistress to take charge of the new building. She was appointed as an agent for the Savings Bank of South Australia in 1886. 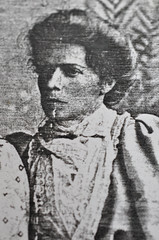 She left Curramulka in mid 1891. The Evening Journal newspaper described her farewell from Curramulka when “Miss Sadler was made the recipient of a handsome marble clock by the residents and an album and silver coffee pot by the Wesleyan Church and school. Mr. R. C. Jones and Mrs. Williams made the respective presentations. Many wishes were expressed for Miss Sadler’s future success and happiness. Miss Sadler returned thanks in a few well-chosen remarks”. In late 1891 she was appointed postmistress at Willunga after the death of Henry Rothwell Pounsett on 27 July 1891 and she was appointed as an agent for the Savings Bank of South Australia in March 1892. In 1895 she was appointed District Registrar of Births, Deaths, and Marriages for the District of Willunga. Also in 1895 she is mentioned in the South Australian Register newspaper when she presented a butter dish to Mr. and Mrs. C. C. Oldham, who were leaving Willunga on account of the closing of the branch of the National Bank during a farewell for them held at the Oddfellows Hall. Esther Sadler left Willunga in 1901 after 10 years as the post and telegraph mistress. The Australian Christian Commonwealth newspaper reported on her departure “On Good Friday evening a service of song, "Peter the Fisherman," was given by the Sunday-school choir, and friends. At the close the Rev. A. Grewar, on behalf of the school and parents, presented Miss Sadler (who is leaving the district) with a set of silver spoons, in token of their love and esteem. Miss Sadler has been a diligent and active worker in the school for many years, and great regret is felt at her departure”. She then spent 13 years as postmistress at the Kilkenny Post Office until she retired at the end of January 1914 and she died, aged 87 years, at Prospect on 6 June 1942. Do you remember Sadler, Miss Esther ? Then Join up and add your memory here.